Michael Keelan began his career as a member of the Lincoln Symphony and with his own musical family. He attended Baldwin Wallace College (now University) near Cleveland, and was a member of the Fairfax (VA) Symphony outside Washington, D.C., while at the University of Maryland. He served as full-time artist/instructor of upper strings at the Wausau (WI) Conservatory of Music from 2004-08, also conducting the Wausau Area Youth Symphony. 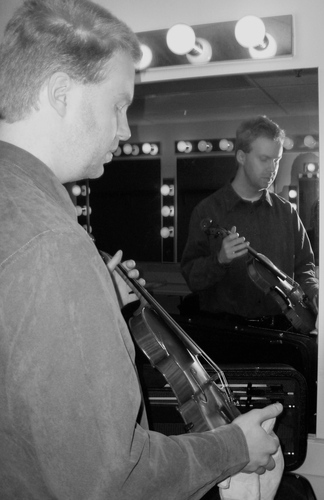 In 2004 he began playing as concertmaster of the Green Bay Symphony, continuing until 2013, where he worked with numerous international soloists. In a related capacity, he conducted for the symphony’s youth orchestra program. He was additionally principal second violin of Appleton's Fox Valley Symphony during 2008-11. During the summers of 2010 and 2011 he taught at Baldwin Wallace’s Summer Music Institute, and he returned in 2014 as recitalist in the university’s nationally known festival of J.S. Bach’s music. In 2011, he was soloist with the Sioux City (IA) Symphony in John Corigliano's Red Violin Chaconne, and in 2012 served as guest concertmaster of Lincoln’s Symphony Orchestra. Since 2011 he has taught strings at Concordia University-Nebraska, and in 2015 formally joined the Omaha Symphony. He works regularly as a coach and adjudicator with Omaha and statewide youth orchestras. His playing has been aired on Nebraska and Wisconsin public radio, and he hosted the program Nebraska Concerts on statewide NET Radio from 2013-15. Michael Keelan was a student of Morris Collier, Anton Miller, Julian Ross, and Elisabeth Adkins. You can contact Michael Keelan at smkeelan@yahoo.com.